How many times have we read news similar to this hypothetical episode? Do you know what might have happened? Do you know why it could have happened? Do you know what could have been done to avoid the accident? This article focuses on the skidded stall in the traffic pattern. The skidded stall is one of two classic cross-controlled stalls or traffic pattern stalls. The other is the slipping stall. We’re going to concentrate on the skidded stall in particular because of its nasty habit of tucking “under the bottom” at the stall break. The classic skidded turn to a stall arises from uncoordinated (yawed) flight with a little overzealous elevator. The recovery we’ll discuss for this type of stall actually works for any stall. We’re going to emphasize awareness, recognition, avoidance, and recovery techniques for the skidded stall.We’ll take you through a hypothetical traffic pattern turn where everything seems to go wrong. Then we’ll dabble a bit in aerodynamics in order to understand the pilot actions necessary to produce a skidded stall and the intuitive (but incorrect) reactions that can lead to disaster. Then we’ll hit the rewind button and replay the skidded stall with the correct pilot inputs for recovery based on our aerodynamics discussion.This discussion is based in fact: Loss of Control In Flight (LOC-I) and Controlled Flight into the Terrain (CFIT) continue to be the #1 causes of airplane crashes and fatalities in the flying world; from GA aircraft all the way up to the “Big Boy” airlines. In fact, when you peruse the NTSB reports, the skidded stall, in my opinion, seems to be one of, if not the leading precursors to traffic pattern crashes and fatalities in GA aircraft. We’re now about half way around the base turn to final at about 500 feet AGL and we notice we’re still going to overshoot, and so we feed in even more left rudder (almost full deflection). Still nothing bad happens, so why worry? We again compensate the left rolling tendency with right aileron to hold 30 degrees of bank and feed in a little more aft yoke/stick and increase power to compensate for the additional nose drop. Suddenly and without warning, the aircraft snap rolls to the left to 150 degrees of bank. Not having been upside down in an airplane on a regular basis, we instinctively pull back on the yoke/stick, thinking that will get the nose back to the horizon, and at the same time, we try to roll the aircraft back to the right. The aft elevator input now literally pulls the nose towards the ground less than 500 feet away (because we’re past 90 degrees of bank) and the right roll input results in a further left roll to near inverted. If we were smart enough to let go of the left rudder, we’ll probably just split-S into the ground. If we instead hold the rudder, we’re now in an incipient spin (stall combined with yaw). We might get one or two turns before ground impact. Obviously, neither of these choices offers a high probability of survival. Let’s discuss more on traffic patterns stalls and how to recognize, avoid and recover from them. If we were lucky enough to have had proper “hands-on” recovery training in a course like that offered at APS Emergency Maneuver Training in Mesa, AZ, and other schools across the U.S., chances are good that we wouldn’t be in this predicament in the first place. Obviously we stalled the aircraft. But this was no ordinary stall; certainly not the same stall we practiced over and over during our normal flight training. The big questions are, why did we end up inverted and why did our intuitive recovery actions end up in catastrophe? So let’s talk. I want to caveat the discussion by stating right up front that I went to Texas A&M…yep, a full-up Aggie…which means that I’m not very good at doing math in public. So with that in mind, we’ll stay away from aerodynamic formulas. We’ll discuss this in simple terms, terms that make sense to you in the cockpit. If you’re really interested in the geeky stuff, there are some great books and papers that discuss cross-controlled stalls in detail. It’s important to understand why skidding an aircraft in the traffic pattern can lead to bad things. First, we’ll define exactly what a stall is. Most of us already know this. But, it’s a great review, so we’ll start there. Then we’ll look at some basic differences between straight-wing versus swept wing aircraft in terms of stall characteristics. Then we’ll look at what cross-control inputs do to us in normal versus stalled flight. I’ve heard many different iterations of the definition of a stall in my dealings with students, but the bottom line is (with the very rare exception of a tailplane stall) that a stall is nothing more than exceeding critical angle of attack (AOA) of the main wing. That’s it – simple, straight forward – no frills…just exceeding critical AOA. The airflow over the top of the wing starts to separate (boundary layer separation) and we experience a loss of lift (note here I state we have a loss of lift – that does not mean the wings stop flying) with an attendant rise in drag. 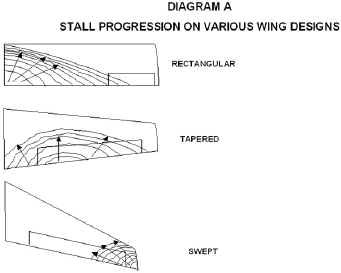 How and where on the wing the stall occurs, how the stall progresses, and how we know in the cockpit that we’re approaching or actually in a stall can depend on many things, including wing shape, tapering, wing twist, boundary layer enhancers (BLEs), stall strips, vortex generators, washout, etc. An important point here is that when a wing stalls, generally the entire wing does not stall at the same time. The only wing design I know of that does (or did) was the elliptical airfoil design used on the British Spitfire fighter aircraft of WWII fame. Most GA aircraft today have wings designed to stall at or near the wing root first. The stall then progresses out towards the wingtips. This is a good thing because as the wing root area stalls, it generates turbulent air that tumbles over the elevator and around the fuselage. We feel it in the cockpit and on the yoke/stick as stall buffet – a warning to effect recovery by reducing AOA. However, when we introduce uncoordinated flight (read skids and slips), all bets are off in terms of how and where the stall will start, or even if we will get any warning in the cockpit. In Diagram A (above), we see several wing shapes. The rectangular and tapered wing shapes are typically what we see in GA aircraft and the swept wing we see in jet aircraft. Notice too that as we begin stalling, part of the wing in each design is still generating lift, e.g. part of the wing is still flying, albeit not very efficiently due to the loss of lift over the stalled area and the associated increase in drag. In fact, if you had a motor powerful enough to overcome the dramatic increase in total drag, you could fly cross-country in a stall (I wouldn’t want to pay the gas bill). At APS, we introduce students to flying in a “full blown” stall as a confidence builder. The name of the maneuver may be familiar to some of you as the “Falling Leaf” Exercise. The Extra 300/L (used at APS), with its AEIO 540 (300hp) can maintain level flight in a full stall (full power)! On a cold day, it can even climb…in a stall! My Cessna 140, on the other hand, with its staggering 85 full-up ponies under the hood, “falls” out of the sky at about 1000 – 1500 fpm in a “full” (yoke in my lap) stall at full power. The important point here is that we’re still flying when we’re stalled. The world doesn’t necessarily end just because we stalled the wings. The control input that gets us into the stall (and out) is the elevator. Too much elevator (forward or backward) and we can exceed critical AOA and stall. In order to recover from a stall, we simply need to get the wing below critical AOA and the way we do this is by repositioning the control input that’s driving the stall – the elevator. In properly loaded GA aircraft, when we encounter a stall, we typically only have to relax the elevator pressure to recover. The aircraft normally pitches over on its own, effectively reducing AOA and we’re out of the stall and on our merry way. In a swept wing aircraft however, we may actually need to push the elevator and hold it forward in order to break the stall. An extreme example of this is found in the U.S. Air Force F-16. If a stall occurs in the F-16, the aircraft has a nasty habit (as do many swept wing aircraft) of pitching even further into the stall when you release the elevator – it pitches into what we call a deep stall. The recovery is a Bold Face/Memory Item to override the flight control computer and manually rock the aircraft up and down in the pitch axis. Hopefully, with enough momentum, the nose will pitch down far enough on one of the pitch oscillations to break the stall. Because of different relationships between center of gravity and center of lift and how those relationships change as a stall progresses, there can be a marked difference between wing designs as to whether we simply need to relax elevator pressure (as with many rectangular and tapered wings) or actually have to input elevator pressure to break the stall (as with a swept wing). Those concepts are beyond the scope of this article. Suffice it to say that elevator (which drives AOA) gets us into and out of a stall. Recovery can be easy, difficult, or even impossible depending on aircraft design and loading characteristics. Let’s look a little closer at the swept wing design and talk a bit about its stall characteristics. Because a swept wing tends to stall at the wingtip first and progress inboard, interrupted airflow gets to the elevator / fuselage last, and therefore there is no stall buffet to warn you…no warning, no buffet, no nothing. So how do we deal with that? Well the designers are way ahead of us. First, they usually give us an artificial stick shaker that generally comes on at an AOA just below the stall. That’s good. They may give us a stall strip that interrupts airflow near the fuselage first which provides us with buffet over the fuselage and/or the elevator. That’s good too. The next thing they may do is move roll control inboard away from the wingtips. That’s also good. This is to ensure that there is some roll control available as the stall starts at the wingtip, (which would immediately render the ailerons useless), and progresses inboard. Sure, the ailerons may start near the wingtips on swept-wing aircraft, but as a general rule, they tend to extend further inboard than GA aircraft. The designer may even include spoilers further inboard as additional roll control. All of these things help. But if we get far enough into a stall, we may involve the ailerons and the spoilers in the stall as well, no matter what the wing shape. Why are we so concerned about this? There’s a good reason: Reverse Aileron Effect. For you in the cockpit, it means that the ailerons (or spoilers) can become unreliable in a stall. In fact, they can roll the aircraft in the opposite direction of the pilot’s input. It just depends how far into the stall you happen to be. Rudder: Rudder is definitely your “Buddy” when recovering from a stall. But, just like anything else, too much of a “good” thing can hurt us. Let’s first look at what rudder input does to us as we set ourselves up in our hypothetical traffic pattern skidded stall. We know that rudder coordinates roll inputs and cancels the yaw effects associated with the engine and prop in normal flight, so it is a good thing when used properly and for the right reasons. But now, from coordinated flight, we enter a skid – uncoordinated flight. As we input left rudder, the nose of the aircraft yaws to the left. But, the airplane also slows down, the nose drops, and we get some left roll too. Well how come? First, as we input the left rudder, the right wing moves forward into the relative wind while the left wing moves back. 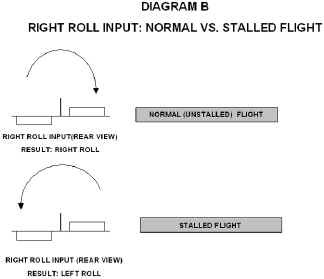 This increase in velocity on the right wing versus the left causes an increase in lift on the right wing and the aircraft gets a secondary roll in the direction of the applied rudder (left in this case). Second, as we yaw, the fuselage “broadsides” into the relative wind and we get a marked increase in total drag. All else being equal, i.e. no increase in power and no increase in AOA (no additional pull on the elevator), this explains the loss of airspeed and the subsequent nose drop. In order to maintain our bank angle, airspeed, and pitch angle while skidding, we have to input right roll to maintain bank angle, increase power to overcome drag, and pull harder on the pole to increase AOA and maintain pitch angle. When we yaw unnecessarily, we are in uncoordinated flight.Look at diagram B (above). Here we have a right roll input. In normal, unstalled flight, as we apply right aileron, the left aileron moves down and the right moves up. This effectively increases the local AOA (and the CL) on the left wing and reduces the local AOA (and CL) on the right. The resulting differential of lift between the wings is depicted on the graph and the aircraft rolls to the right. Now take the same relationship and move it beyond critical angle of attack and into “stall world.” The local AOA is still higher on the left with our right roll input. But here in stall world, increasing AOA means less lift, not more. The aircraft rolls to the left with a right roll input! Will this happen invariably? Maybe, maybe not. Again, it depends on wing design and any “tricks of the trade” the manufacturer has thrown in to help mitigate this reverse aileron effect. One thing’s for sure though, don’t bet your life on the ailerons giving you proper roll control in a stall, especially if you’re stalled, inverted, and less than 500 feet from the ground. In rectangular wing designs, the ailerons are located near the wingtip, where the wing typically stalls last. My Cessna 140 has a rectangular wing design and in fact, the ailerons work as advertised a good way into the stall. But eventually, they too roll the aircraft in the opposite direction of my input. In the Extra 300/L, the wing is a tapered design and the ailerons are involved in the stall almost from the outset. Reverse aileron effect is almost immediate as we enter a stall in the Extra and makes a great demonstration for the students. So how do we control roll in a stall to help “right” the airplane, orient the lift vector skyward, and minimize altitude loss? 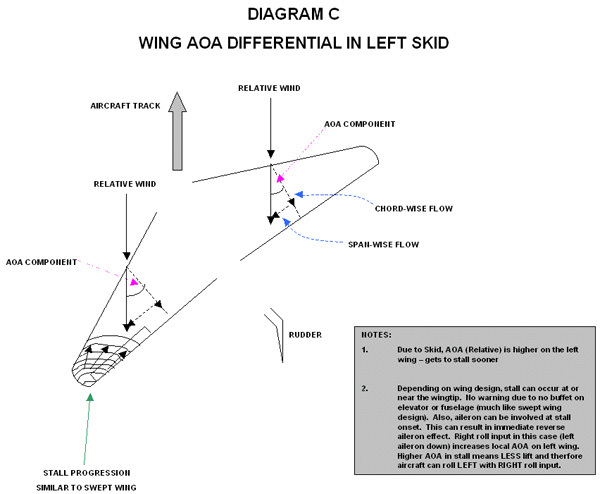 The associated secondary roll due to the yaw input means that the trailing wing (left in this case) has a higher effective AOA than the advancing/rolling right wing (see diagram C). This means that as we approach critical AOA, the trailing wing (left in this case) will likely stall first. Even worse is the fact that as we input right roll to compensate for the secondary left roll effect when applying left rudder, we effectively increase the local AOA on the left wing even farther (left aileron down, right aileron up). This gets the left wing in our example to critical AOA even sooner. But even more interesting is the fact that the left wing in our left skid can now take on some of the characteristics of a swept wing design. Assuming we get a little overzealous with the elevator in this case, where do you think the stall will occur? You got it, it’ll happen farther outboard from the wing root, maybe even near the left wingtip first. And where do you suppose any interrupted airflow from boundary layer separation is going to go? It really doesn’t matter, because bottom line: it isn’t going over the elevator or around the fuselage…no buffet, no warning, Nada! You may get no warning at all that the stall is about to ruin your day. Depending on which wing is involved and the placement of your stall warning horn, you may not hear the horn either. Even worse is that since the stall is going to occur at or near the wingtip, the left aileron is involved in the stall almost immediately and that means reverse aileron effect may be involved from the outset of the stall. With a right roll input (left aileron down, right aileron up), we have higher AOA on the left wing (left aileron down). Only since we’re stalled, higher AOA means less lift and with a right roll input, the aircraft rolls rapidly to the left, further aggravating an already bad situation! How fast does the aircraft roll when it enters a skidded stall? It can be pretty eye-watering. The Extra 300/L will roll to approximately 150 degrees of bank in less than a second! My Cessna 140 does pretty much the same thing!! Incorrect instinctive reactions at 500 feet AGL will pretty well seal the outcome. Most folks will instinctively pull on the pole when inverted. This “intuitive” reaction is the last thing you really want to do. Pulling now pitches the nose towards the ground and more than likely keeps us in the stall. The other intuitive reaction is to attempt to roll the aircraft with ailerons to level the wings (right roll input in this case). The result: even more roll to the left. Bottom line: intuitive recovery techniques don’t work for this one. So how do we get out of this beast and get our pink bodies and our steely sky conveyance safely back on Terra Firma? 1. Push. The first step in any stall recovery is to reduce AOA below critical AOA. We do this by removing the input that got us into the stall to begin with – elevator. Relax elevator pressure. For those of you who fly swept wing aircraft, you may actually have to push the elevator forward (in this case) to break the stall. 2. Power. Power should be used as required. But what it does for you is help overcome increased drag from uncoordinated flight and helps to preserve precious altitude. If the aircraft is excessively nose low and you’re gaining speed rapidly, pulling the power to idle may be the option of choice. For more detailed discussion on Power considerations in varying situations, please have a look at APS’s article on the All-Attitude Upset Recovery Checklist. 3. Rudder. Apply rudder to visually cancel yaw. Note, we don’t want to use the ailerons to roll the aircraft in a stall because we know they can be unreliable (reverse aileron effect). We also know that once we break the stall, the ailerons are our best roll mechanism. But we have to give the first step in the recovery (Push) a chance to get us below critical AOA before we can safely use the ailerons. In the meantime, our yaw canceling mechanism in the stall is the rudder. Rudder application to cancel yaw should be used for two reasons: (1) It counters adverse yaw, which can happen when we have a differential in the drag on each wing. The stalled wing in this case (left) has more drag than the right due to the higher AOA. In fact, if the drag differential is high enough, it can contribute to a spin entry – correct rudder input overcomes this. (2) Rudder application to cancel yaw can possibly help roll the aircraft in the direction of the applied rudder for the reasons noted earlier. As a result of applying proper rudder, there will be higher AOA and less lift on the right wing in stalled flight and lower AOA and more lift on the left wing in stalled flight. With proper rudder application, the yawing tendency (due to negative roll damping) will be stopped in its tracks. Once the aircraft is below critical AOA, the ailerons can then be safely used to complete the roll to wings-level. How much rudder should be used? The answer depends on the airplane and the rudder authority We may not want to use full right rudder in the Extra, but we might need more rudder (at least momentarily) in a lower performance airplane. In the Extra, a small and brief application of rudder is all that is needed to reduce any adverse yaw and get the aircraft rolling in the correct direction. I need just a bit more rudder input for recovery in my Cessna 140. Aside from possibly stopping or preventing a spin departure from the skidded turn, opposite rudder application (rudder in the direction of wings-level, against the skidded stall) also allows the aircraft to remain fairly coordinated throughout the recovery. As an aside, full rudder application is always used in spin recoveries, but for reasons which are also beyond the scope of this article. In our case, we’re talking about catching the skidded turn at stall departure-and prior to spin entry–so the exact amount of rudder to be used can vary. 4. Roll. Level the wings using aileron and coordinated rudder. If the first three steps were properly executed, the aircraft will no longer be stalled, however, the flight attitude must be addressed. Leveling the wings orients our lift vector in the vertical prior to moving to the “Climb” step next. 5. Climb. Using aft elevator (control column back) smoothly rotate the aircraft to a Vy pitch attitude, being cognizant of avoiding a secondary stall as well as managing g-loading to adhere to the load limit of your aircraft, and confirm that full-power has been selected. Look for two sources indicating a positive rate of climb. For example, the altimeter and the VVI/VSI, or the altimeter and trees that are getting smaller. At APS Emergency Maneuver Training, we let students “explore the envelope” in skidded stall scenarios. This gives them hands-on experience in terms of awareness, recognition, avoidance, and recovery from this and many other “bad” situations you can encounter in an airplane. We’re not saying all cross-controlled flight is bad. A properly flown slip, for example, is a useful maneuver to master. After all, you should slip your plane when you land in a crosswind (unless you’re flying an Ercoupe). The manufacturer has already (hopefully) told you in the POH to add knots when landing in a crosswind. This is because a slip is uncoordinated flight and the extra knots account for the increase in stall speed. If you have an older plane like I do, it doesn’t say anything in the POH about crosswind landings. Add airspeed (5 to 10 knots) when landing in a crosswind if your POH doesn’t tell you to. We want to impress the need to understand what happens when you cross-control (skid / slip) an airplane. (1) Get proper training in slip and skid scenarios. APS has a great Emergency Maneuver Training program with eminently qualified instructors. But, there are other good emergency training programs across the country. Reading and doing are two separate worlds – the training is invaluable and could save your life – get it somewhere. (2) Don’t, (REPEAT) Don’t skid the aircraft in the traffic pattern – Ever! Skidding serves no practical purpose for the GA pilot. It really doesn’t help and it can end up really ruining your day. Skidded stalls tend to be nasty because they tuck “under the bottom” at the stall, as we have seen. (3) Level the wings and go around. Don’t ever be embarrassed about the overshoot or doing a go-around, both of which are far better than being a little dead because you skidded the turn below 500 feet AGL. Besides, one pilot’s go-around is another pilot’s fly-by! What is your best defense in aircraft unusual attitude or upset conditions? First, attempt to avoid conditions that can induce unusual attitudes in the first place! Steer clear of thunderstorms and wake turbulence! Avoid IMC or flight into low visibility conditions if not properly certificated and trained. Avoid distractions. Second, get the proper training. According to an article in AW&ST (May 8, 1995 issue): “Training should include flights in aerobatic aircraft to practice recovery techniques because no simulator can model the disorientation of actually being upside down… recurrent training every two years, with time in an actual aircraft, would be a good start.” Regardless of the aircraft that you fly, proper training will enable you to learn to react decisively in a high-pressure environment, and to learn proper recovery techniques to avoid a “panic” response that could worsen the situation. Contact APS. Discuss with us our wide variety of solutions to meet your needs or fill out the form below. Get this training somewhere. The life you save may be more than just your own.